This sweet little rainbow design intrigued me. 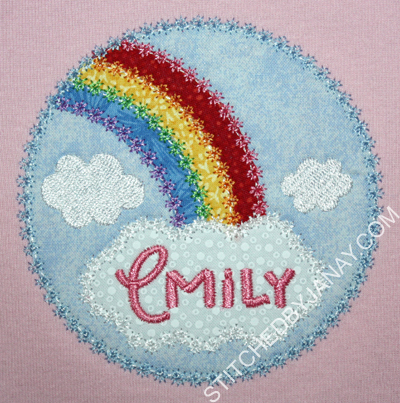 I wanted to use the 4x4 design and needed a little girl with a short name... Emily it was! Bonus, I already had a onesie in my stash her size, woo-hoo! 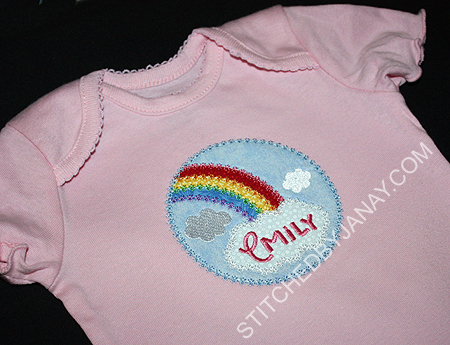 The applique is Lynnie Pinnie's Rainbow Frame Deco, such a quick stitchout! 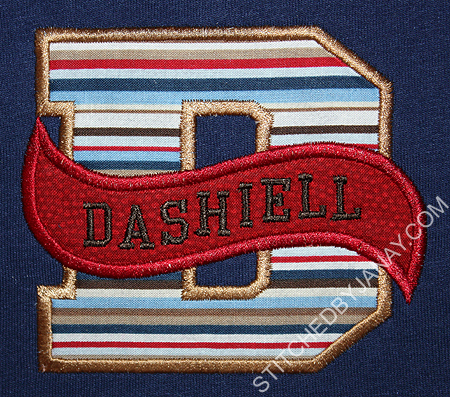 (There is a satin stitch version, too.) I added her name with LP's new Strawberry Limeade font. 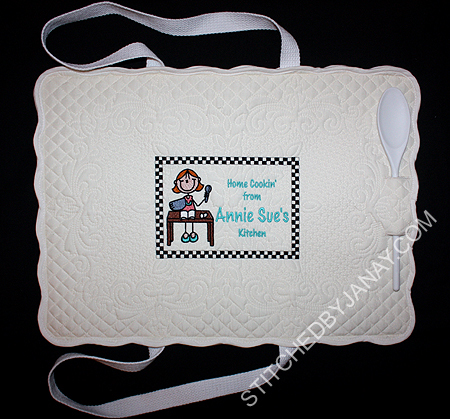 This is the smallest size and stitched beautifully! I was anxious to play with 3 fabrics and 4 thread colors to make a colorful rainbow. I opted for red/yellow/blue for the fabrics, and pink/orange/green/purple for the threads. I think it turned out really pretty using the secondary colors for the threads instead of perfectly matching! 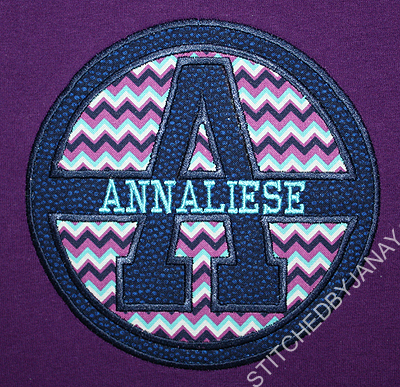 The applique alphabet comes in 4 sizes. The Split Banner numbers (1-12, plus several extras) are sold in a different set. 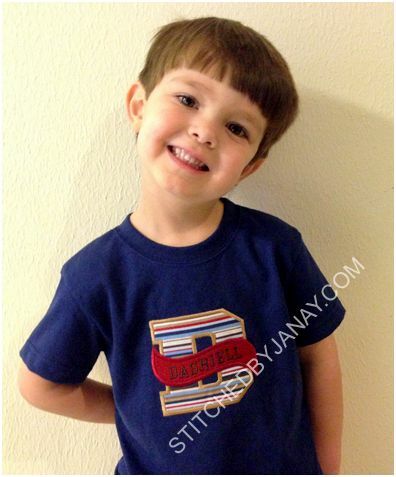 Great for birthday shirts, anniversary designs, 100th day of school... what else can you think of? Currently there is a sale: if you buy the banner alphabet, you get the numbers for free! Sale runs through Sunday 2/24, so hop to it. Aren't these so cute?! 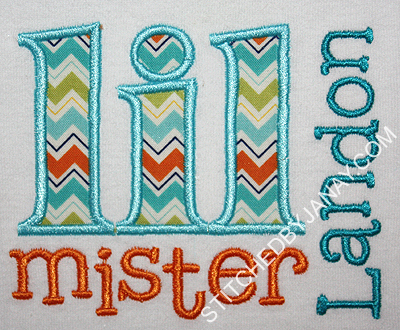 As I was merging together designs similar to my last sibling set, an embroidery friend of mine showed off pictures of her most recent project. I stopped in my tracks and changed plans! I was super excited when I scrolled through my 8CP font images that I found High 5 was a perfect match to add their names! 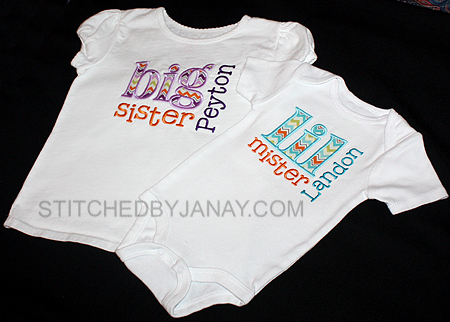 Peyton loves purple, so I was excited to use these Riley Blake chevrons, purple/orange for her and aqua/orange for him. 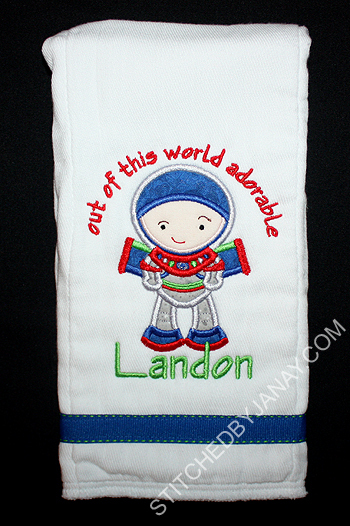 I also did this burp cloth, using Lynnie Pinnie's Little Cutie Space Explorer Boy. I was testing it for LP and intentionally decided to not use the Buzz Lightyear white/purple/green color scheme to show how versatile the design could be. Out of this world adorable! 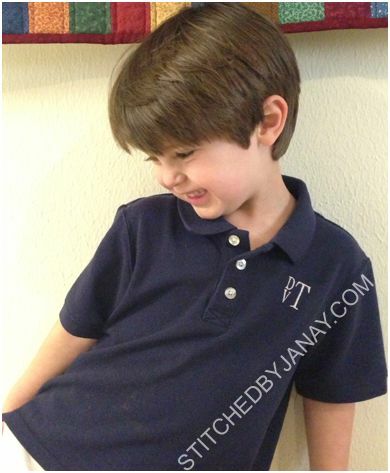 Grandma sent Dashiell a couple of polos, and I added his monogram to them this weekend. The stacked monogram on the navy shirt uses Back to Basics from 8CP. I used the half inch size for D and V and 1" size for the T (maybe a touch of resizing and adjusting pull compensation to get it to form a little square). Super pleased how it turned out, literally a 2 minute stitch time. Took longer to hoop the shirt! 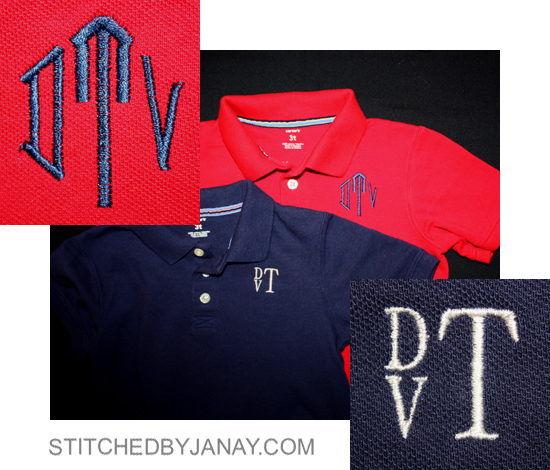 The traditional monogram on the red shirt is 8CP's brand new Formal Monogram. I used the 2" size. Anyway, it sure turned out cute!! 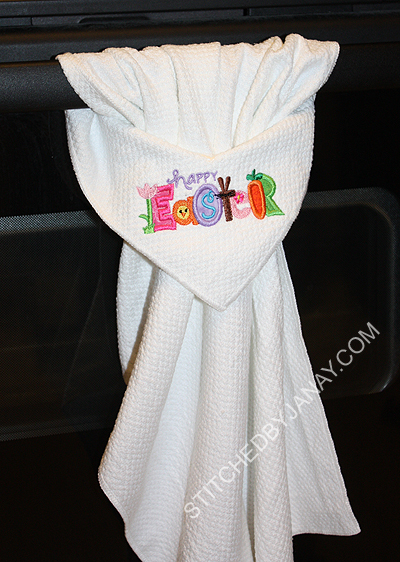 I was thrilled to find a design that had heart shaped dots AND the Love Bug text already merged together! I anticipated having to do a bunch of design editing to accomplish my goal, but I didn't! Woo-hoo! Quick side note, gotta love a wonky shirt. :/ And this is from Gymboree! I'm usually very diligent at examining shirts in stores before buying, I don't know how it passed inspection. Oh well, at least it was on clearance with additional sale. It was really hard to decide how to place the design since nothing is straight or even. Ultimately I centered with neckline instead of width across. Thankfully it looks good on! 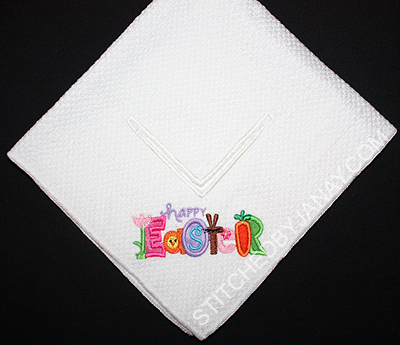 I had the opportunity to test this sweet "Happy Easter" applique design for Lynnie Pinnie. 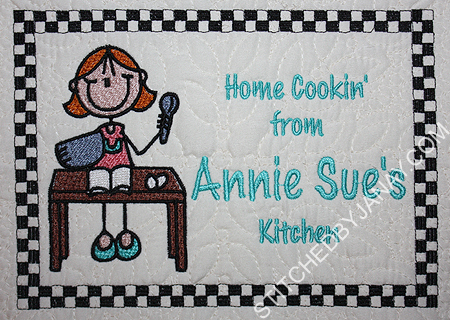 I wanted to put the 4x4 size on a kitchen towel, and decided to use this as an opportunity to experiment again! I love how it turned out! I looked through my stash and couldn't find a fabric that would make a nice base for the design, and thought... do I even need add a fabric square to the towel before making it a Stay-Put towel? Could I just do the V shaped hole with the design directly on the towel? Why yes I can! The design purchase I was most excited about was snagging the Circle Letters Applique Set from Beau Mitchell Boutique at 75% off! It had captured my attention when it was released and was on my wish list for a long time. I finally put it to use yesterday! Isn't this cute?! She was a happy camper when she woke up this morning! I realized I still had a couple of long sleeved shirts in my stash that she probably won't be able to wear next winter. Both are dark and not appropriate for upcoming holidays. I'm so happy I remembered this monogram set! And the chevron from Hobby Lobby matches perfectly. 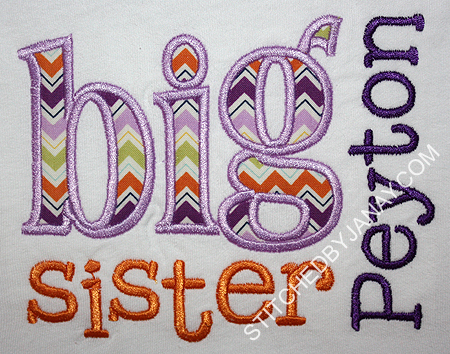 I added her name with 8CP's College Block Small, totally impressed with how well the 1/2" size stitched. She recently requested that I make a similar one for her to give to her daughter for her birthday. I was happy to oblige!